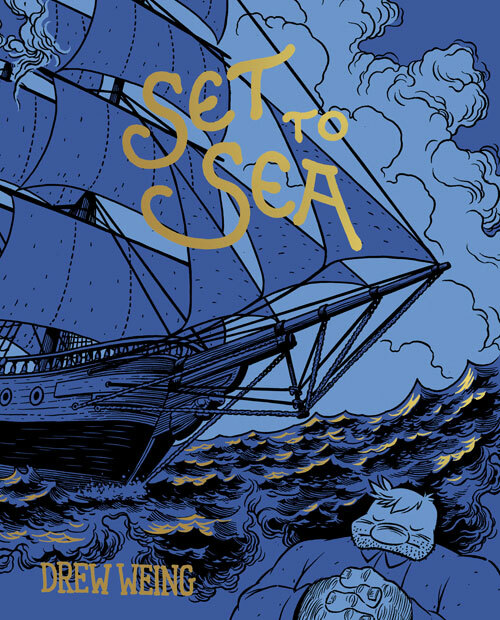 Set to Sea is Drew Weing's recent graphic novel debut from Fantagraphics. It opens with a destitute poet, who's captured and forced to work on a ship sailing for Hong Kong. He's quite resistant to living aboard ship, frequently complaining that he's a poet and not cut out for that type of life. That is, until a pirate ship attacks them and he's shot in the eye. His retaliation is unnerving and he earns the respect and admiration of the rest of the crew. He resigns himself to living his life on the seas, but tries to resume his poetry. Years go by, and he eventually retires from sailing. His poems are collected and printed in a handsome volume, which quickly wins praise from all sectors of society for its sincerity and honesty in relaying life at sea. The protagonist gains a modicum of fame and the book closes with him being treated royally at a tavern that kicked him out in the early pages of the book. The story is pretty simple and straightforward, with no sub-plots and very few characters.Accordingly, Weing lays out the story in a fairly simple and straightforward fashion as well. No fancy tricks or clever change-ups. Each page is it's own splash (though none are imposing, since the book measures only just over six by five inches) and there's not even very much dialogue. In fact, the book is quite elegant and warrants multiple readings just so you can appreciate how Weing handles everything. I'll also point out that he includes more than a few artistic nods to other artists from Rockwell Kent to Howard Pyle to E.C. Segar. The moral of the story is obvious enough, but smartly not overly emphasized. In order to create works with any artistic merit -- not that "maudlin tripe those Americans are usually fond of" -- one needs to really experience life. You can't write (or draw or whatever) with much integrity if you can't infuse your work with the passion that comes from living life and having first-hand experiences. Think of the creative works you made in high school, and compare them with what you created as you got older -- that high school stuff (hopefully) looks like hollow crap by comparison. Some of that is practice, of course, but a lot is also the rest of your life's experiences. Excellent advice. Told in an excellent manner.